The new MultiChannel Sales for WooCommerce module for iThemes Sales Accelerator allows you to sell your WooCommerce products on other marketplaces as well, including eBay and Amazon. 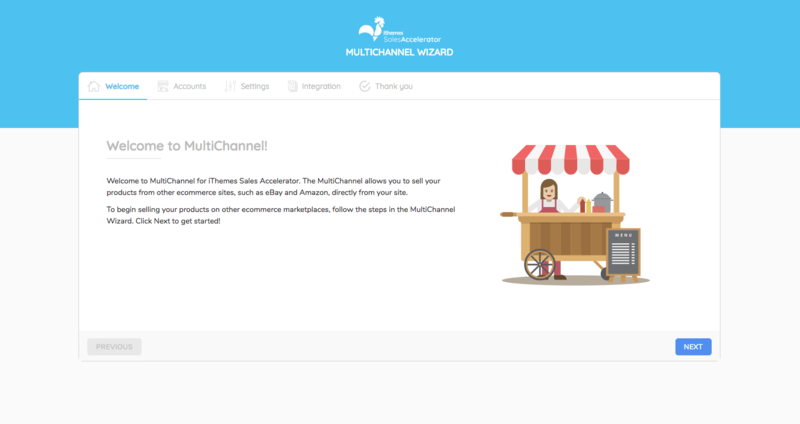 In this post, we’ll cover how to get started with the MultiChannel module for iThemes Sales Accelerator. Current iThemes Toolkit, Plugin Suite and iThemes Sales Accelerator Gold will find the iThemes Sales Accelerator – MultiChannel plugin available now from the iThemes Member Panel. Note: To begin using MultiChannel, you first need to install and activate the free iThemes Sales Accelerator plugin. 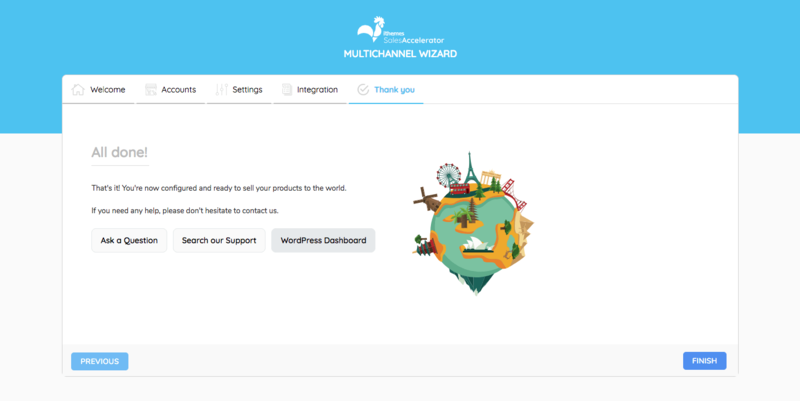 MultiChannel requires the free base plugin to work, and can only be used with version 1.2.7 or greater of the iThemes Sales Accelerator plugin. 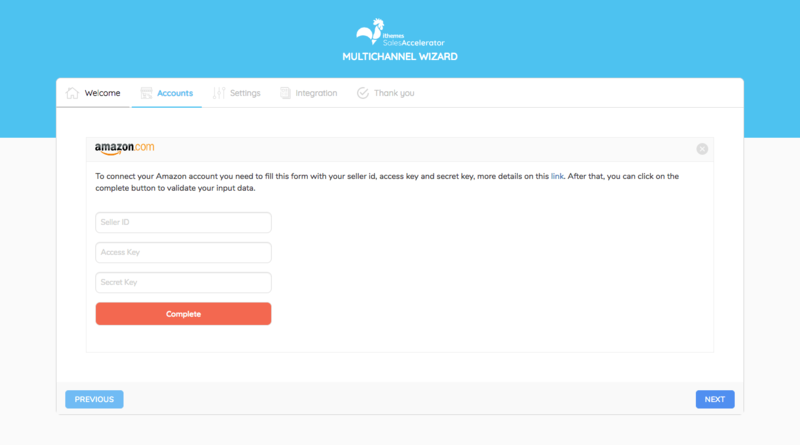 Once you have installed and activated the MultiChannel module for iThemes Sales Accelerator, you will be automatically redirected to the wizard to set up MultiChannel for your site. 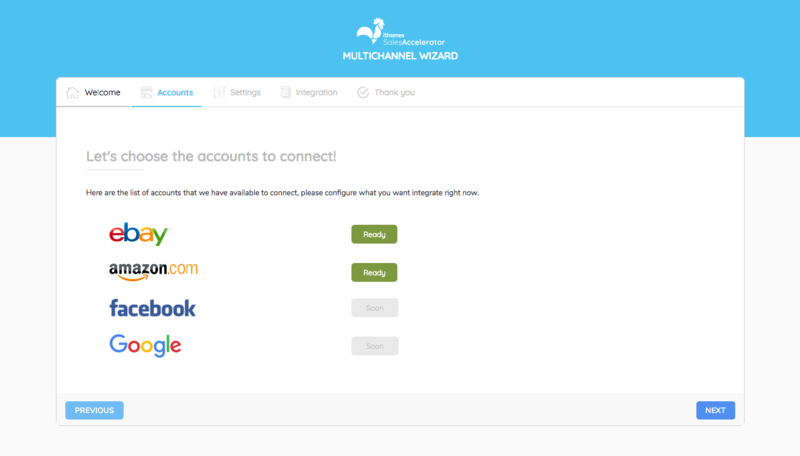 To begin setting up your eBay and/or Amazon accounts, click the Next button on the Welcome page of the MultiChannel Wizard. On the Accounts page, you’ll select which account(s) you want to set up. Your current options are eBay and Amazon. Clicking the Configure button for eBay directs you to a page to get started connecting to eBay. First, you’ll want to select the country your store is in. 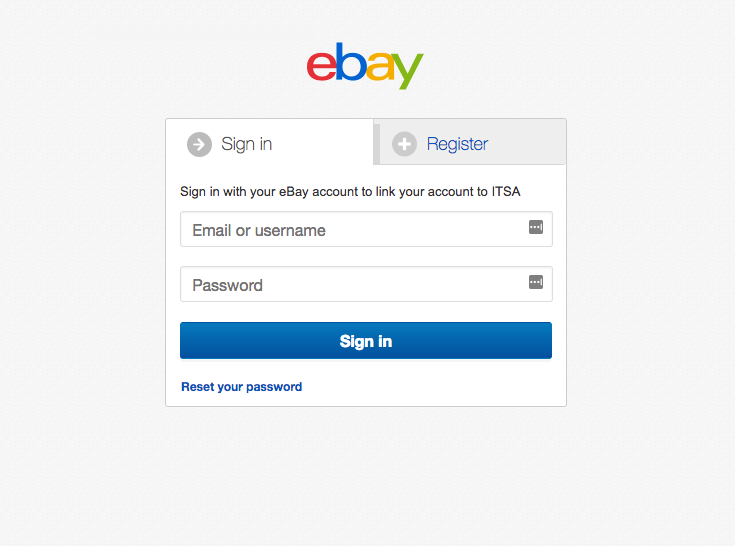 Then you’ll click the Connect button which will take you to eBay’s login page. After signing in, you will need to grant iThemes Sales Accelerator (ITSA) access to your eBay data by clicking the Agree button. Once the connection has been successfully completed, you will see a Thank You page from eBay. 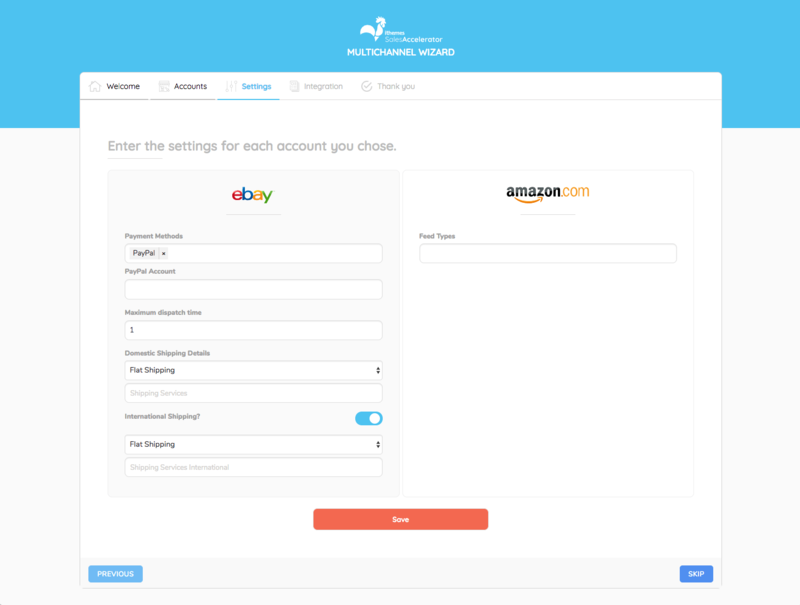 When you see that page, it is safe to close that tab and move back to the MultiChannel Wizard, where you’ll then click the Complete button to finish adding your eBay account. 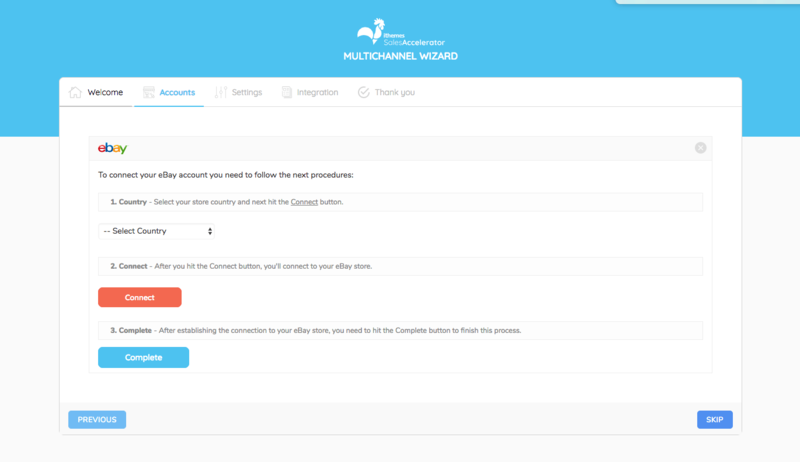 Once you have hit the Complete button, you will be taken back to the Accounts page in the Wizard. From here, you can either add another account or you can hit Next to move on to the next step. Clicking the Configure button for Amazon directs you to a page to get started connecting to Amazon. On the Amazon account page, you’ll just need to enter your Seller ID, Access Key and Secret Key. Once you’ve entered your information, you can hit the Complete button which will take back to the main Accounts page. Once you’ve finished setting up your accounts, click the Next button to move onto your settings for each account. The settings for eBay include Payment Methods, PayPal Account, Maximum Dispatch Time and your shipping options. If you are using PayPal, you will need to enter the email address associated with your account in the PayPal Account field. For the Maximum Dispatch Time field, you’ll enter how many days you, as the seller, guarantee an order will be dispatched. For example, if set to one, you are promising the buyer that their purchase will be sent within one day of their purchase. 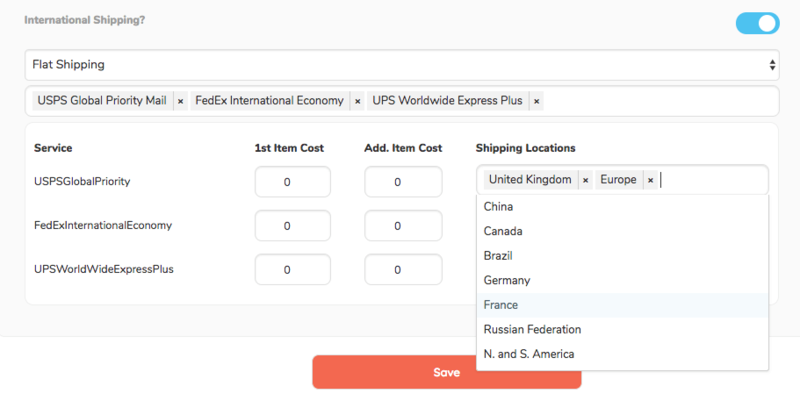 For your Domestic Shipping settings, you can choose between Flat Shipping and Calculated Shipping. You’ll then select the shipping services and methods you wish to offer. Once you have selected all the shipping services and methods you wish to offer, you will set the rates for each of them. If you have selected to use Calculated Shipping instead of the Flate Shipping option, you will also see an option to enter a packaging charge. 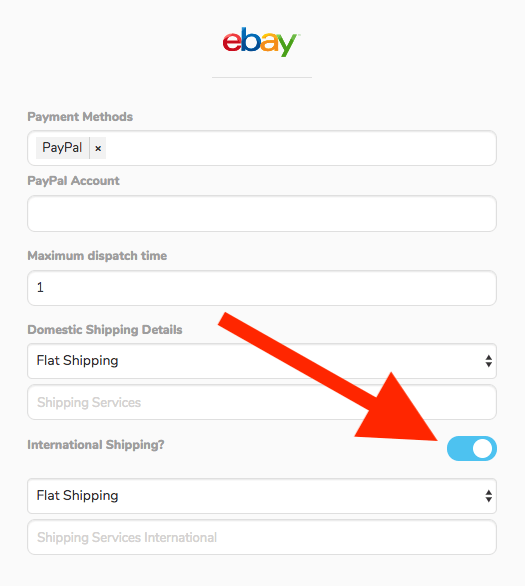 If you do not wish to offer International Shipping, you can toggle this option off. The settings for International Shipping are very similar to Domestic Shipping. You’ll first choose between Flat Shipping and Calculated Shipping, select your shipping services and methods and then add the cost for each option. With International Shipping, you will also need to select where you are willing to ship to. 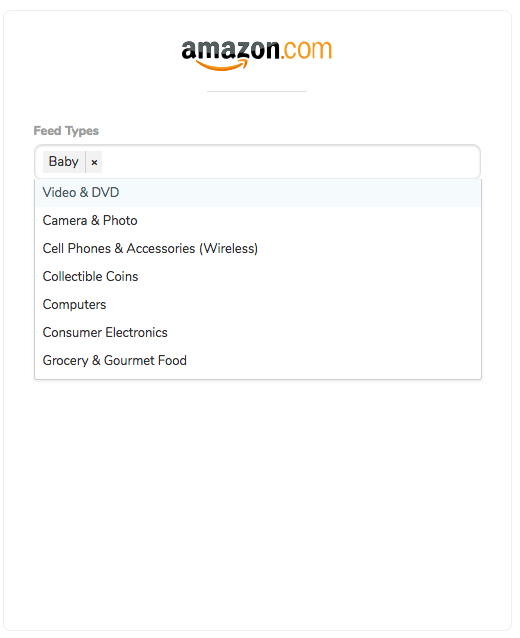 For your Amazon settings, you’ll simply need to select your Feed Types. You can select multiple options for your Feed Types if necessary. Once you have entered all the details for your account settings, hit the Next button and you’ll be taken to the Integration page. This page simply explains how to add pre-existing products to be sold on eBay and/or Amazon. To sync up your pre-existing products, you will need to go into each product you want individually. Under the Product Data tab, you will see options for the accounts you have added to MultiChannel. Go through these adding the details you need to and, once completed, click the Update button for the product. And that’s it! You’re now ready to create your products for eBay and/or Amazon! Note: If you ever need to go back to the Wizard, you can access it from Sales Accelerator > Settings at the bottom of the page under both eBay and Amazon. Once you’ve entered your eBay and/or Amazon account details, you will need to go to Sales Accelerator > Modules and toggle the MultiChannel module on. You can then begin selling your products. The product will still be available in your WooCommerce store and you can sell it on both eBay and Amazon simultaneously. To get started creating your eBay and Amazon products from WordPress, be sure to check out the iThemes Sales Accelerator Help Center articles. With the MultiChannel module for WooCommerce, you can ignite interest in your online products by launching them across two of the biggest e-commerce platforms on the planet, Amazon & eBay—all without leaving your WordPress dashboard!